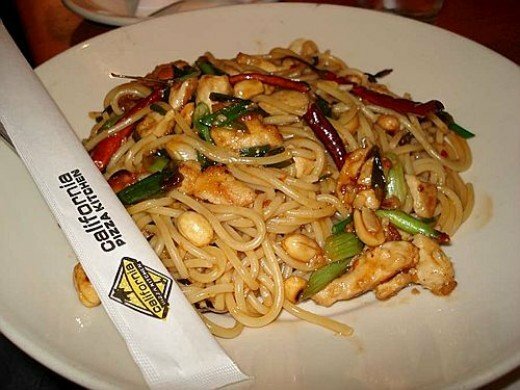 According to the California Pizza Kitchen website their Kung Pao Spaghetti is make with a classic Kung Pao sauce with garlic, green onions, peanuts and hot red chilies. When you order you may choose chicken, shrimp or chicken & shrimp combo. The recipe below looks like a lot of ingredients but it is very easy to make. Get everything out and cut up before you start cooking. Mix the cubed chicken & peel shrimp with corn starch and soy sauce and marinate for 1/2 hours. Mix the seasoning sauce in a bowl and set aside. Heat oil in a wok or skillet and fry the chicken or shrimp until done. Heat a little oil in a wok and stir fry the veggies until they are slightly tender. Add the seasoning sauce, stirring until thick. Add meat, stir until thoroughly heated. Add hot peppers and flakes. Cook for 1 minute. Turn off the heat, add peanuts, mix well. Toss in drained, cooked spaghetti.